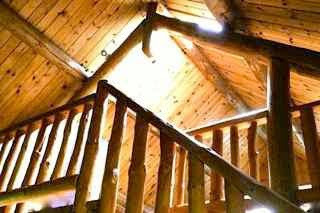 Cottage interior design style makes a room feel charming, warm, naturally comfortable, casual, simple, and livable. The general feel of the cottage design style is informal and imperfect. The goal of using the cottage interior design style is to create an inviting interior with a carefree and well-lived in look. The cottage interior design style reflects the comfortable, relaxing, and informal feeling of living either in the mountains or on the beach. It can be easily mixed with other design styles and it has some similar design elements with the rustic, country, and shabby chic interior design styles. 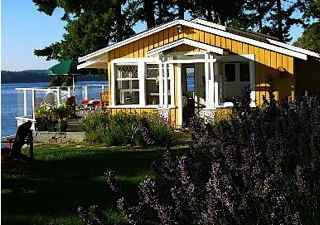 The cottage style is frequently confused with the eclectic style. The cottage style is defined by its décor and its color palette more than the eclectic style. The eclectic design style is a combination of styles that includes or contains a large collection of colors and unique furnishings, while the cottage style has a recognized casual informal look and soft color palette. The color palette for the cottage design style reflects nature elements such as the sea or the mountains depending on your location or region. Colors used in cottage design style are soft and neutral such as a mix of gray, soft yellow, cream, brown, green, white, blue mint, oyster shell, baby blue, lavender, soft pink, and taupe. Light blue, white, and turquoise are perfect color combinations you can use for a beach cottage style look. 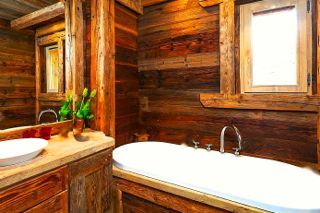 Honey color tones or light colored woods such as oak, pine, and maple are a good choice for a mountain cottage design style. Natural materials, such as stone, wrought iron, wood, tin or pottery are used when designing a space with the cottage style. Ships, shells, anchors, and sea creatures are great accessories you can use for a beach cottage style to bring the beach inside. Fabrics used in the cottage interior design style are durable, versatile, stain resistant, and easy to maintain; such as cotton, chenille, linens (summer), burlap, corduroy, leather, and wool (winter). Furniture used is usually simple and oversized. Comfortable and stylish wicker, wood or iron furnishings with cushions covered in floral fabrics. White painted furniture, vintage accessories, and white slip covered sofas. Add plenty of throw pillows on the sofa for relaxation. Floors are made of wood or stone depending on the look you want to achieve. For a contemporary or modern look add stone or stucco to your cottage design style. 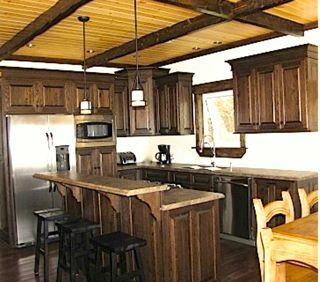 For a traditional look add wood floors, wooden wall panels, and wood ceiling beams to your cottage design. Simple lightweight window treatment fabrics are used in the cottage design style to ensure plenty of light enters the room. Sheers, lacy white curtains, and shutters are a great choice for window treatments. Fresh flowers, plants, and vases are elements used in the cottage design style. 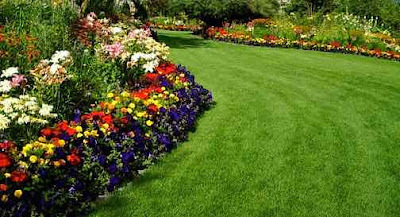 Pick flowers that might grow in a cottage landscape garden design such as roses, lilacs, lavenders, and daisies. Light fixtures with painted glass shades are used in the cottage design style. Light fixtures are usually not matched. Lanterns and candles are great light options in a cottage interior design. For a classic cottage style look mix and match floral and stripe patterns. Hardwood floors are left bare in summer and rugs are added in the winter. Antique items and collectables are important elements of the cottage design style. Utensils are used as accessories; such as copper or iron pans and pots hanging on the wall. Handmade pottery, hand-forged metal, wicker baskets, carved wood, old paintings, old quilts, and braided rugs are used as accessories in the cottage style. Open shelving made from oak or natural pine will give you a traditional cottage style look. Floral print wallpaper, outdoor furniture, flower arrangements, and pots of plants are used in cottage design style to bring the outdoors inside. 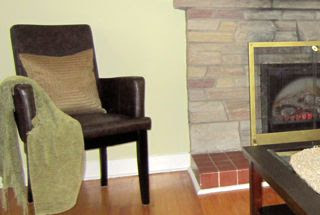 A fireplace is usually used as the focal point in a cottage design space. Whether you have a chalet in the mountains or a chalet on the beach that you want to design or you just want to create a cottage design style in your home, you can incorporate some of these elements or all of them in your design space to achieve the look and feel of the cottage interior design style.